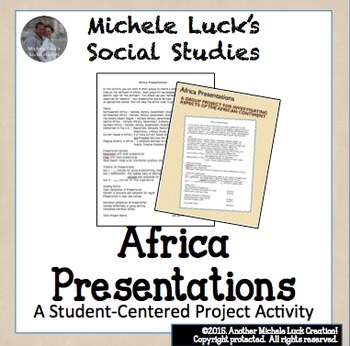 Investigate the African Continent and Countries with this engaging student project rubric. 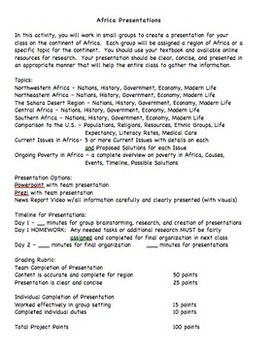 This activity allows students to work in small groups to research and present various aspects of Africa from countries and geographic features to people and human issues. A one page assignment sheet also serves as a rubric for grading. This is also part of my Complete Unit on the Geography of Africa. Other activities from the unit are also sold separately, but save 30% when you buy the complete set! See my TpT Store for other great Geography, World History, U.S. History and ELA products!